I'm beginning to really warm up to life across the pond. Big things like being with a best friend who I can share all my new experiences with, landing a job and finding community, have been really helpful. Small things are also helping me feel at "home" more each day, things like: Skype calls, a date night out for fish and chips, learning the tube and train routes and so on. It's amazing how much we (I'm assuming it's all of humanity) cling to familiarity. I think it's good to have it pulled from beneath us every now and again. Having my habit-slate wiped clean has given me the opportunity to re-evaluate what I hold dear and start afresh in certain areas. My friend Kaitlin, who recently married and moved to Holland, told me that living abroad would put Kurt and me on "the fast track to becoming one." She wasn't kidding! It's such a great way to start our life together. Although being newlyweds and living in another country means more challenges, it also means the experience of being here is worlds more fun. I would gladly take the challenges over being here by myself. In much the same way that a long-distance relationship pushes you to learn good communication fast, being here is pushing us, in many ways, to build a strong marriage. And seeing as we're stuck together anyway, why not start now? haha. 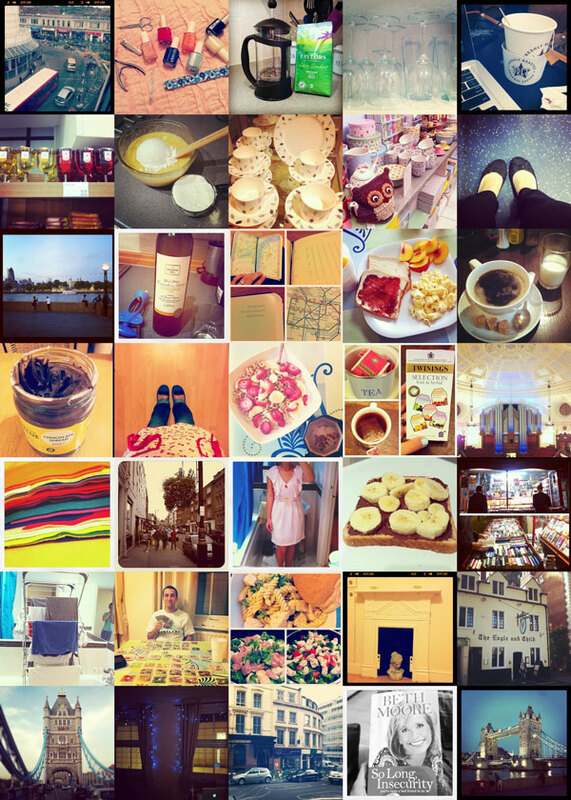 I thought it'd be fun to share my first month in Instagram photos. So here we have it! What are some ways that you stop and re-evaluate what you hold close? Oh and I'm curious what motivates you the most to work on building your marriage or relationship(s). I'm with you...having your habit slate wiped clean is good every now and then. Josh and I talk about how our marriage has benefitted greatly from starting it away from all familiarity and having nothing to cling to but each other and God. haha! I can only imagine how it is being abroad. Glad things are going well! First off, very sweet blog redesign. I'm a huge fan, and seeing as I have no idea how to do design work on a blog, I'm a tad bit envious too. I love you! I want to visit you guys and the Hess duo so bad. I'll let you know when someone anonymously donates a few thousand $ to me. Kaitlyn, thanks! I had fun with it yesterday, I needed something a little less summery. You're right, reaching out to intentionally find community is a LOT better than sitting at home left to your loneliness and lies that creep in. Even if it is intimidating sometimes (which it def can be for me). I often think of you because I've always been encouraged/challenged by your intentionality in connecting with others. Jodi, I'm glad that you and Josh have found the same to be true. It was hard for me when I moved to California. Of course I wasn't married at the time, but I think it was good for me to face the change on my own first and now I'm getting to face it with Kurt (which I prefer, haha)...I'm a little more ready this time. I hope you guys are doing well with the transition and what not. I'd love it if you wrote a post about what settling in there has been like and what you've done to create a home there and find community. What a sweet update - I really like your pic collage, too! Steve & I were talking just tonight about wiping clean "the habit slate" - looking to hold dear the redemptive work of God in the lives around us rather than our own comforts. It was fun to see a similar idea in your post. I like your "habit slate" term, btw. In our marriage, a big motivator for me has been the simple fact that if I don't "build" then I'm tearing down. There will be movement in one direction or another - nothing just stands still. Also, it is a huge thing to know that God has entrusted the heart of another into your keeping. These two facts have really encouraged me to proactively build our friendship and marriage, build up my husband, and build myself into a trustworthy woman.